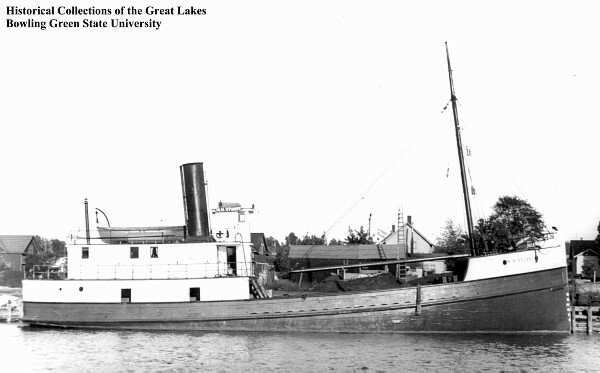 Built and launched in 1921 from Sturgeon Bay as a steam screw, the M.H. Stuart was designed primarily as a fruit boat. With a length of 105 feet and a beam of 26 feet, the Stuart was outfitted with a scotch boiler and fireboxes that had been salvaged from the J.S. Crouse. The Stuart saw well over two decades of faithful service as a scrap barge at Milwaukee harbor before being sold in 1944. At that time her cabins were removed and she was used as a pump barge until she sank at her dock uneventfully in 1948. At the request of the Coast Guard, she was towed out and scuttled. Of course, she didn’t go down without a fight, she was set ablaze and eventually the Coast Guard punched holes in her hull until she finally succumbed to the depths and came to rest in 200 feet of water. In 1981, after snagging their nets a group of fishermen enlisted the help of local divers to see what lie below. It wasn’t until 4 years later, in 1985 that the burned wreckage was positively identified as the M.H. Stuart. At 200 feet in depth, she is only divable by highly trained and equipped technical divers. However, for those that do explore her, they are treated to a semi intact wreck with her decking, prop, and rudder still visible. We visit the M.H. Stuart from Milwaukee.